"Norsk Tipping - Lottery Norway - including Viking Lotto & EuroJackpot"
If you are familiar with the Norway Lottery games that come from Norsk Tipping in Hamar, Norway, you will know that there are various different Norwegian Lotto games brought to you by Norsk Tipping.no and Lottery Norway. Many of these Norway Lottery games are played not only within Norway itself but right throughout Scandinavia and Europe. Due to the presence of online lottery ticket agencies such as TheLotter anyone can now easily buy lottery tickets online for these Norway Lottery games not just locally but from anywhere in the world. We will be writing in detail about each Lottery Norway game that you are able to play online that is available from NorskTipping – just go to the Global Lottery Review World Lotteries page for a full list of national lottery games and world lotteries with their individual review pages. Here we are simply going to list each of the Norway Lottery games that are available from Norsk Tipping.no including the Viking Lotto – Vikinglotto – and EuroJackpot. You can also click straight through to read all about the game of your choice. The Viking Lotto was the world’s very first multi-national lottery. It is operated by 8 national lottery companies throughout Scandinavia: Norsk Tipping – the Norway Lottery company – Veikkaus in Finland, Danske Spil in Denmark, Estonia's Eesti Loto, Sweden’s Svenska Spel, Islensk Getspa the Iceland Lottery company plus Lithuania's Olifeja and Latloto from Latvia. The Viking Lotto is also known as the VikingLotto, Víkingalottó, Vikingu Loto, Viking Loto, Onsdags Lotto, OnsdagsLotto, and the Norsk Viking Lotto. It is by far the most popular lottery game to be played throughout the Scandinavia and Baltic regions and boasts a record jackpot of NKr 216.12 Million which was won on May 15th 2013 by a single player in Troms, Norway. Read a detailed review of the Lottery Norway – VikingLotto and check the most up to date Viking Lotto Results. The Lotto from the Norway Lottery company – NorskTipping – is the flagship game offered in Norway and is drawn every Saturday. It is the primary game to be offered by Lottery Norway and is a typical jackpot lotto style game with a matrix of 7/34 + 1. This Norwegian Lotto from Lotto.no is incredibly popular in Norway and beyond. The Lotto started here back in 1986 with the first Norway Lottery draw taking place on April 19th. The Lottery Norway – Lotto – record jackpot to date has been an incredible NKr 47 Million won on December 22nd 2012 by a man from Akershus and there have been at least 3 occasions when NKr 20 Million or more has been won on the Norway Lottery. You will find further information about the Norway Lotto at NorskTipping. With Lottery Norway and NorskTipping, you can play Joker in conjunction with both of their primary Lotto games – the Viking Lotto (on Wednesdays) and Lotto (on Saturdays). By playing the NorskTipping – Norway Lottery Joker you can easily increase the size of your winnings on the Viking Lotto or Lotto by a significant amount. The Lottery Norway – Joker – began in the May 2000 and the record Joker jackpot to date has been NKr 4.9 Million paid by NorskTipping to a woman from Buskerud in 2004. 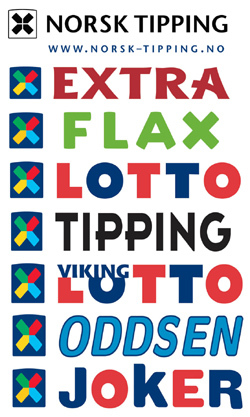 The Norway Lottery – Keno – was launched by NorskTipping more recently in November 2007. This highly popular Lottery Norway game takes place every day and the results are displayed on NorskTipping. With the Keno game you choose how much you wish to play for – from NKr 5 to NKr 100 – and this determines the size of the amount that you can win. Basically, the more you play for the more you can win. The maximum Keno jackpot you can win is NKr 20 Million. Simply choose how many numbers you wish to play between 2 and 10 out of a range of keno numbers from 1 to 70. Then choose the amount you wish to play for. 20 Keno numbers are drawn each day and if you match 10 – you win the Keno jackpot. You can find more information at NorskTipping. As well as Norway Lottery games – NorskTipping offers a variety of other online games. These include Tipping which is all about wagering on football games – league and international. Oddsen – whichagain involves placing wagers on various football games plus numerous other events including hockey, handball and the Olympics and winter Olympics. Extra is a Bingo-type game from Lotto.no that is tailored to television by Lottery Norway. Just click on any of the above lottery links and they will take you directly to your chosen Norway Lottery game. Each page contains a detailed review about that particular offering from Lottery Norway and gives full NorskTipping information. We will, in time, be reviewing even more Norwegian Lotteries and will add them to this Lottery Norway overview section as and when we review them. For the time being, we hope you enjoy reading about the main NorskTipping games – the popular Viking Lotto as well as the Euro Jackpot and the NorskTipping Lotto and checking the latest VikingLotto Results and EuroJackpot Results. We wish you the best of luck should you decide to participate in any of them.